Simba is the Swahili word for lion, the king of the jungle and a symbol of sovereignty, might and amour-propre. The Serengeti Simba Lodge is well-named, as AfricanMecca guests on our Tanzania safaris look to enjoy and experience the amazing power and sovereignty the Serengeti African wilderness brings together. From high upon the Gambasage Hill overlooking the Grumeti River, the Serengeti Simba Lodge is in eyeshot of the western annual migratory path of wildebeest from its location at Fort Ikoma Serengeti Gate. Not only will you on your live, action packed Africa photo safari in Tanzania enjoy comfortable and hospitable accommodation and service with panoramic views of the savannah, the area is home to a stunning array of big and small fauna including lion, cheetah, leopard, buffalo, giraffe, elephant, rhino, with a myriad of thumping hooved herbivores from eland, impala, kudu, hartebeest, gazelles and many more. 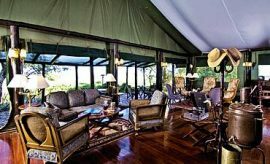 Serengeti Simba Lodge is easily accessible by road and air on your Tanzania vacations. Once arriving, you are treated to a perfect mix of adventure and comfortable accommodation, along with great food and a range of activities and services, all with fabulous views in the peaceful and serene atmosphere that you expect from your Serengeti trip. The lodge was fashioned not only to provide guests with comfortable accommodations in a magnificent location, but with a quality dining experience as well. Whether you choose an evening campfire dinner surrounded by bush sounds or an open-air breakfast, each meal will be an exceptional delectable experience. The evening sundowner is not to be missed, with cocktails served as you watch the orange hue from the sun drop sharply to a darker shade. 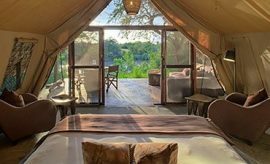 From 15 unique and beautifully-furnished tent rondavels that combine the romance of a tent with a semi-permanent structure (see Serengeti accommodation types), AfricanMecca guests can enjoy privacy and comfort at the Serengeti Simba Lodge. 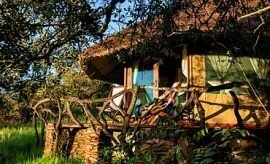 Eco-friendly solar power ensures hot water, battery charging, and other amenities, including en-suite bathroom with tub, shower and flush toilet. Additionally, there are 6 executive rooms in the Stone House that offer amazing views across the rolling grassland. 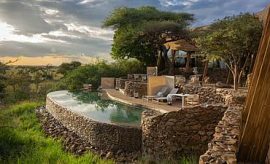 You can watch the panoramic vistas of the Serengeti from poolside, while nightly campfires allow you to relax and listen to the echo of bush sounds. Facilities include a large dining room and outdoor deck with scenic views of the plains, a lounge with fireplace, a fully stocked bar, Internet access, gift shop, and battery charging station. 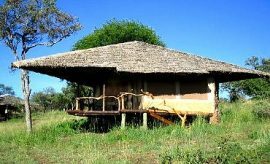 The Serengeti Simba Lodge is committed to improving the lives of the surrounding Ikoma community, and was built using local materials and construction. Construction blends into the surroundings with as little disturbance as possible, and the lodge uses solar power for the majority of its operations. Serengeti Simba operates in an environmentally friendly manner, with minimal chemical use and water conservation. Kitchens are supplied with organic local produce where possible, and the gift shop is stocked with items made by local artisans that will personally connect you to your African cultural safari tour and stay at Serengeti Simba Lodge. Serengeti game viewing is done in custom 4x4 safari vehicles under the guidance of an experienced and knowledgeable AfricanMecca Safaris guide. Vehicles are linked with radio communication equipment where wildlife footprints, sound and last spotting information are shared amongst discretionary guides to maximize your game viewing opportunities. The location of the Serengeti Simba Lodge being on the western boundary of Serengeti National Park in a private conservancy allows you to opt for additional activities that are not available inside the park boundary. 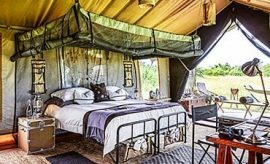 These include walks and night game drives as optional add-ons. Hot air balloon safari within the Serengeti National Park is also available for those of you who want a bird's eye view of wildlife beneath. The Great Serengeti Migration is one of the few remaining wildlife spectacles on our planet, following a migratory path for more than 8-9 months of the year around the Serengeti and 3-4 months in Masai Mara (The Serengeti side of Kenya), and Tanzania tours offer a unique opportunity to observe this phenomenon (see Serengeti wildebeest migration map). In Western Serengeti where Simba Lodge is located, the migration can be best observed from April to June (see best time to visit Serengeti). The Serengeti is a huge ecosystem where millions of wildebeest follow a trajectory path on their annual trek passing other resident herd members. From Western Serengeti, the wildebeest continue to follow greener pasture and water opportunities through Northern Serengeti crossing the Mara River border in search of better grazing lands in the Masai Mara National Reserve in Kenya and then returning back to North Eastern Serengeti around November. Apart from the wildebeest migration spectacle, the Serengeti is also home to millions of herbivores, carnivores, birdlife and insect life. Predators and scavengers are prolific, including leopard, cheetah, lions, hyena and more. 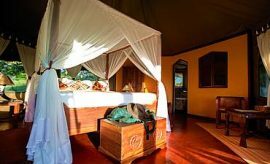 Serengeti Simba Lodge is a spectacular location from which to watch and appreciate this vast array of incredible Tanzanian wildlife while on your Africa tours. Your day will begin with morning tea/coffee in the company of your AfricanMecca Safaris guide who will review your day's plans in line with your previous day activity and sightings. Breakfast consists of a selection of hot and cold choices, or you can take breakfast along on an early morning game drive for those who want to stay on longer. 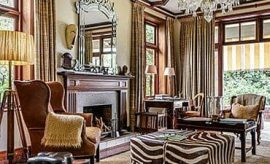 Safari-style includes European and East African options. 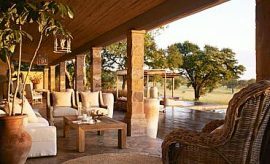 Lunch offers opportunities for a siesta to renew your leisurely time in the wild leading the way to an energized afternoon game drive. The traditional evening sundowner on your Serengeti safari game activity will have you heading off to the best sunset spot after a successful wildlife tracking and viewing spectacle in the cooler late afternoon as the fauna settle for the night. You can keep an eye out for predators readying for the night's hunting, while enjoying the scenic view of the sun dropping below the endless plains. Dinner is a culinary experience not to be missed, whether you choose meat, fish, poultry, or vegetarian cuisine. Local communities source the produce, and choices include a mix of western cuisine and the ethnic foods you would expect from your Africa holiday. A wide range of drinks are available to order, from wines, beers, and spirits to fresh fruit juice and soft drinks. The finest Tanzanian coffee and tea are always brewing. 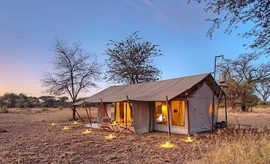 If your choice is breakfast, lunch or dinner in the bush, that can be arranged optionally. Dedicated sites offer a bush bar and bush kitchen with a wide range of delicious food offerings cooked on site. 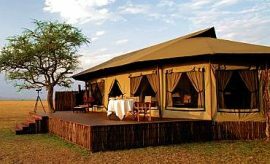 When staying at Serengeti Simba Lodge in Western Serengeti (Grumeti River Corridor), we recommend combining it with your Northern Tanzania safari to Tarangire, Lake Manyara and Ngorongoro Crater. End your trip with a Swahili cultural tour and beach holiday in Zanzibar.